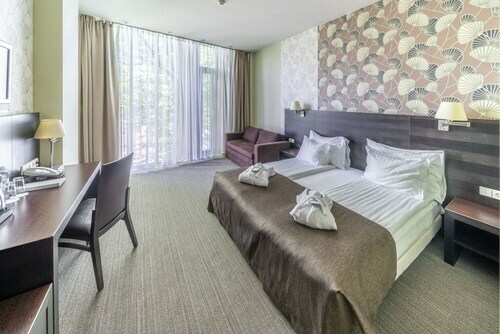 Located in Sampeteris, this luxury hotel is 0.7 mi (1.2 km) from SPICE and within 3 mi (5 km) of University of Latvia Botanical Garden and Riga Castle. Cathedral Square and Livu Aqua Park are also within 9 mi (15 km). 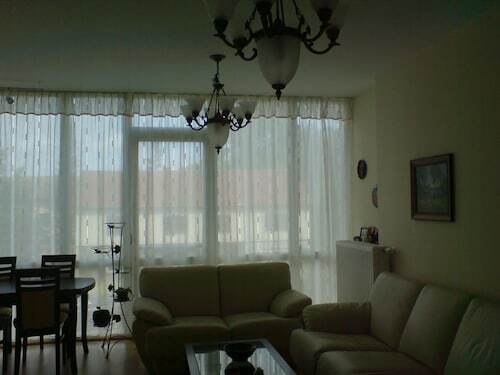 Located in Pleskodale, this apartment building is 0.9 mi (1.5 km) from SPICE and within 3 mi (5 km) of University of Latvia Botanical Garden and Uzvaras Park. Golden Bowling Center and Latvian Railway History Museum are also within 3 mi (5 km). 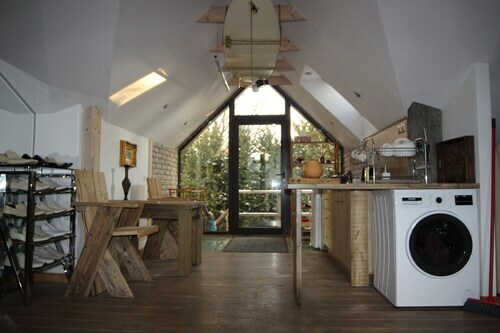 Located in Sampeteris, this romantic property is 0.5 mi (0.8 km) from SPICE and within 3 mi (5 km) of University of Latvia Botanical Garden and Uzvaras Park. 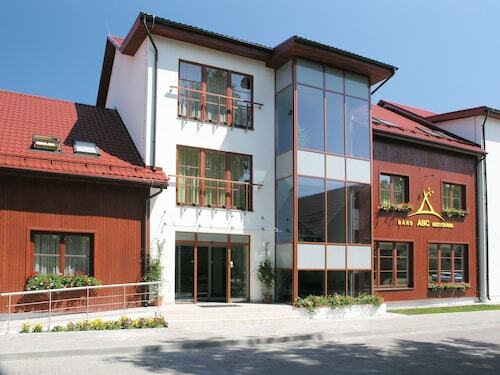 Golden Bowling Center and Latvian Railway History Museum are also within 3 mi (5 km). Question : How much is a plane ticket to Riga (RIX) from Amsterdam (AMS)? Answer : Cost can range from $233 to $605, prices for AMS to RIX fluctuate less than the majority of routes from the Netherlands. However, usually the sooner you book, the better price you get. Question : What is the cheapest date to fly to Riga? Answer : Apr 29th has bookings (as of Apr 22nd) as cheap as $294. That comes in 29% below the average price. Saving now gives you more moolah to spend on your trip. Question : Which airline has the least delays from Amsterdam to Riga? Answer : Air Baltic leads the way with a 92% on-time rate. 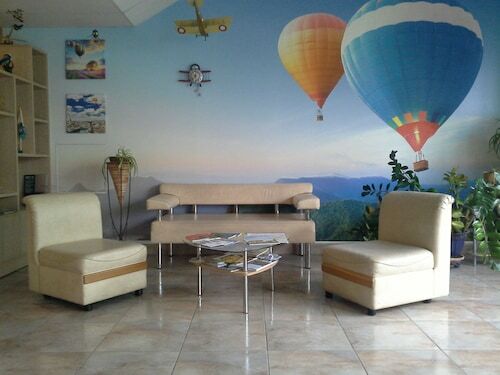 Spend as little time in an airport as necessary by flying with Air Baltic. If they are delayed for some reason though, the average delay is less than 15 minutes. Answer : You sure can and you may save by changing when you leave. The cheapest day to fly in May is Thursday. Being flexible with your travel days can provide you extra savings when booking. Question : How long is the flight from AMS to RIX? Answer : Air Baltic can get you there in two hours and 15 minutes. For example, if you were to leave Amsterdam at 10:20 AM CEST, you would arrive in Riga at 1:35 PM EEST. Just enough time if you want to catch up on your television shows before you touch down (don't forget, there is a one hour time change). Question : How much time do people spend in Riga? Answer : The average time spent in Riga by travellers from Amsterdam is about one week. Question : How many flights are there per day from Amsterdam to Riga? Answer : Depending on the day of the week, the number of flight times will change, but on average there are two. The average route departing the Netherlands currently has four different flight times per day, so expect fewer choices than you're used to. Flights from Pierre Elliott Trudeau Intl. to Jinnah Intl. Flights from Pierre Elliott Trudeau Intl. to Netaji Subhash Chandra Bose Intl. Flights from Grande Prairie AB to Victoria Intl. Flights from Grande Prairie AB to Winnipeg James Armstrong Richardson Intl. Flights from Pierre Elliott Trudeau Intl. to Jacksonville Intl. Flights from Pierre Elliott Trudeau Intl. to Don Miguel Hidalgo y Costilla Intl. Flights from Pierre Elliott Trudeau Intl. to Alfonso Bonilla Aragon Intl. Flights from Saint John NB to Edmonton Intl. Flights from Regina Intl. to London Intl. Flights from Regina Intl. to Licenciado Gustavo Diaz Ordaz Intl. Flights from Regina Intl. to Louis Armstrong New Orleans Intl. Flights from Greater Sudbury to Stanfield Intl.